Above the final drop in Mushroom Rapid on Cherry Creek. Save up to 15% on select Cherry Creek trips with Rapid Deals. It’s simple. Cherry Creek is basically the most challenging commercial river trip in the United States. There’s an entire MILE of back-to-back Class V rapids. There are so many Class III and IV rapids some of them don’t really even have names. If you have time to catch your breath and take a moment to look around, the beauty of the canyon might take that breath right back away. And you get to spend the day with some of the most experienced river guides in California, people who love this river with a passion, and would spend every day there if they could. A trip on Cherry Creek is the most action-packed day you’ll probably ever spend on a river–but if you just can’t get enough, you can combine it with a 1-Day, or even 2- or 3-Day trip on the Tuolumne for a multi-day adventure. 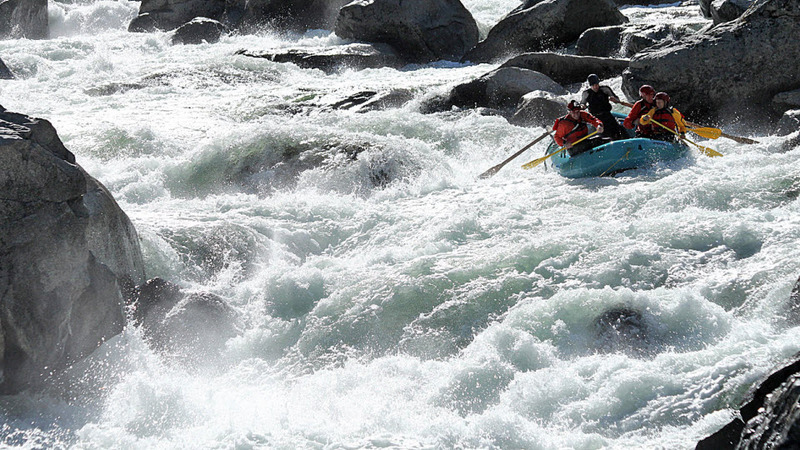 Learn more about Tuolumne/Cherry Creek Combo Trips. Physical fitness and comfort in the water are mandatory for this Class V run, and the usual minimum age is 17 years old. If you have questions about whether or not Class V rafting is for you, check out our Cherry Creek FAQ page, or contact us for more information. Learn more about Cherry Creek and the available trip options. Check out our Cherry Creek video to see this river up close and personal.